Our Brand New Starlok White Sparkling floor with the latest V3 controller will transform any venue and is available in sizes all the way up to 20ft x 20ft. 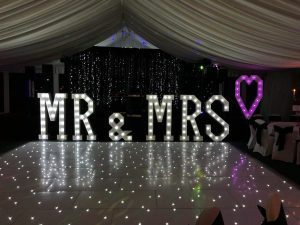 The Starlok Led dance floor is manufactured in the UK and is the only wired dance floor currently on the market with a patented interlocking system that prevents the panels from coming apart during use and ensuring that power will always be supplied to keep each panel Sparkling, rather than a wireless system which has the contacts built onto the panels which can potentially lose power to panels if movement occurs or if other objects / substances get between the panels. Contact us today for prices / availability. Discounts available when booking items as a package.